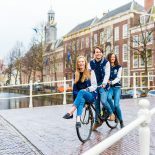 It was last Friday, the final day of exams and papers here at Leiden University College when a group of about 15 students from Kennesaw University, GA, USA, arrived in Zuid-Holland. As in any academic setting, we of course started with a lecture – about pilsners – and I was surprised that even I was able to learn some new facts about my favorite drink. What follows usually a lecture? Right: Group work! So we were split up in 4 groups and had to guess previously presented pilsners from different countries (Holland, Germany, Poland, Czech Rep. and Turkey) according to their taste and smell. Of course –> all of them correct! If you drink (or even brew) beer consciously, you will really find a different side of it than just getting drunk. The science of beer is truly interdisciplinary and is important to consider concerning environmental aspects and agricultural sciences, but also social or economic factors. Many people forget that so much is going on before the beer is served – it’s a science and a profession! No wonder that one of the US-students – a major of environmental Geographical Information Science (definitely my new love since this semester) – inspired me with his bachelor thesis about something with sustainability, breweries, and rural or urban. Definitely to be considered for next year ;). Knowing many of these facts now, we continued our journey to a bar in The Hague where another beer tasting round took place and more information from the brewer of the bar’s own microbrewery was given to us. This time British-style ales: a kind of beer I was not even too familiar myself with before. They really rounded up this fantastic experience. This entry was posted on June 10, 2015 by Thomas@TheLeidener in Student Life, Study, Thomas and tagged beer, The Hague.